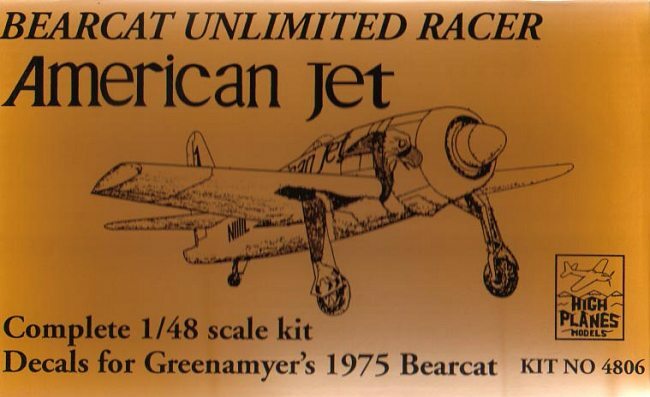 For Reno 1975, Darryl Greenamyer secured the sponsorship of American Jet for his famous N1111L F8F-2 Bearcat racer. The aircraft received a snazzy new yellow paint job with a rather flamboyant bald eagle painted on the fuselage and landing gear doors, and it retains this paint scheme to this day as it sits in the collection of the National Air and Space Museum (Greenamyer swapped his historic record-holder to the NASM for a stock XF8F-1). 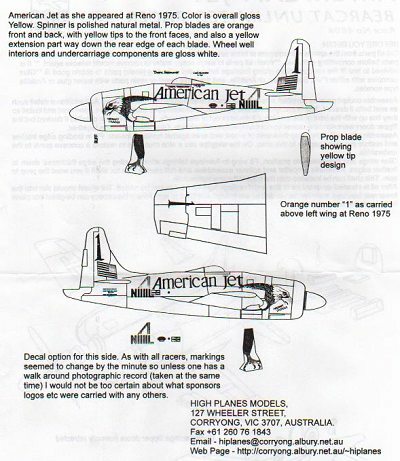 Except for the box art, decals, and markings instructions, High Planes’ “American Jet” Bearcat kit is exactly the same in every way as their “Conquest I” kit #4805, reviewed separately. The decals (shown here scanned at a size other than 100 percent as a courtesy to High Planes) look accurate and well printed. I’ve forwarded this kit to Mark Gran for a full-build review. We hope to have full reviews of both “Conquest I” and “American Jet” on MM in a few weeks.